You know how watermelon, well fruits in general, are all the rage right now? 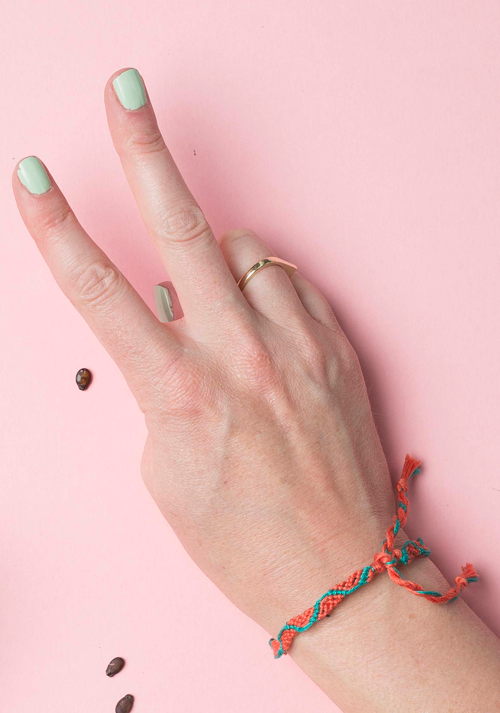 We’re all about it here too and this watermelon friendship bracelet is a little less commitment and a little less $$$ than say, a watermelon headboard or pillow. How sweet and summery is it?! 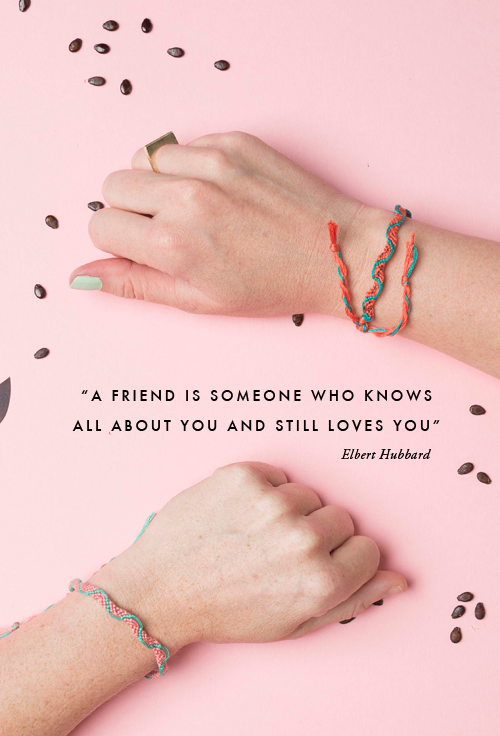 AND, Sunday, August 3rd, is both National Watermelon Day AND National Friendship Day. NAILED IT! For more detailed instructions and closer photos of each step by step, click below. The pink thread can be about 40” and the the green at 45” (you will use more of this string). 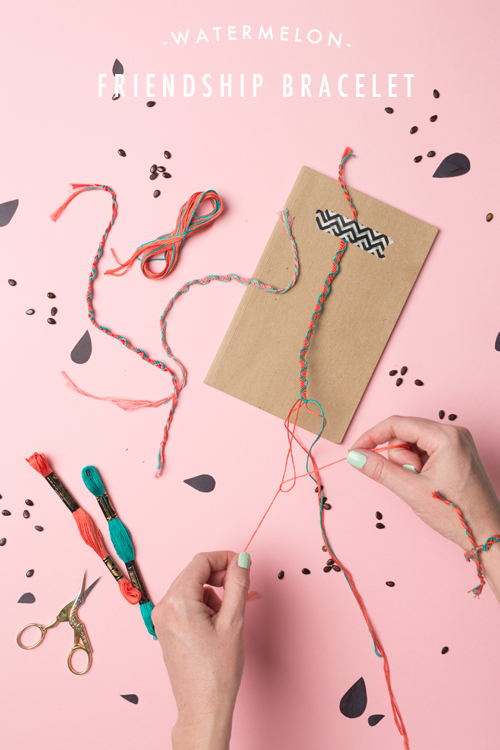 Line up all the strings, tie a knot so only about ¼” of string is on the top. Take strings and divide into two sections, 3 on one side and 2 on the other. Secure the knot so it remains stationary, then take 2 inches of both sections and twist separately in the same direction. Bring the sections together and hold while unsecuring the knotted end. 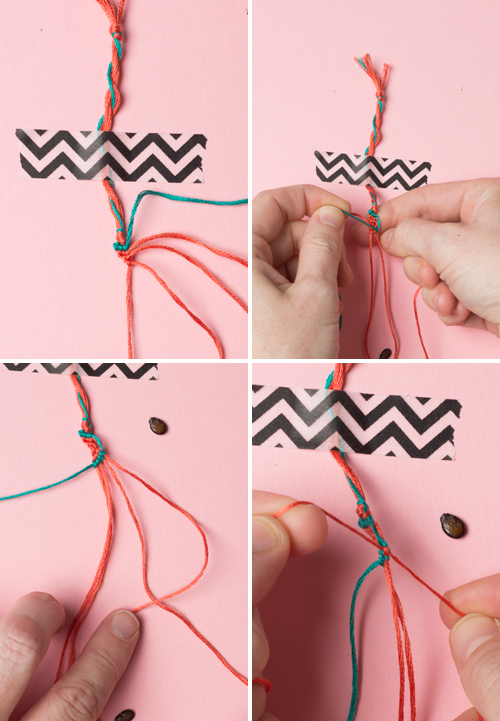 When you let go of the knotted end the two sections should spiral around each other. Take the loose end and tie in a knot. From left to right take the green string and tie two knots (the kind that look like the number 4) on each pink string. You will be tying the green sting onto 4 strings total. 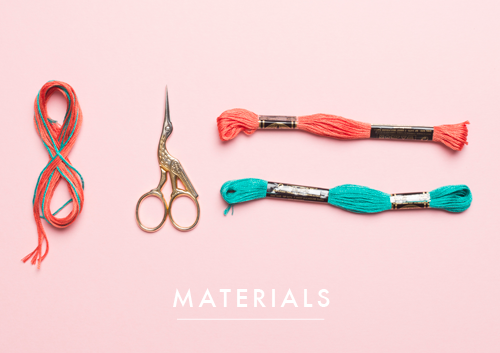 Starting back on the left, take the next string, pink, and tie double knots on each of the remaining 3 pink strings. Do not tie a knot onto the green string. 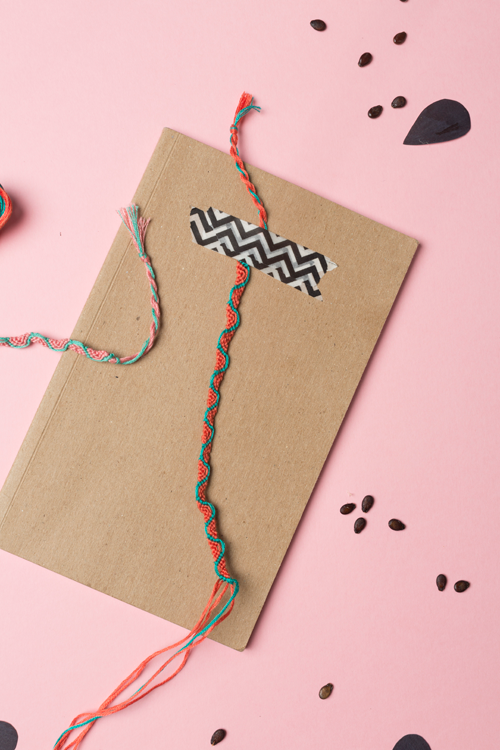 With the next pink string, you will only tie double knots onto the next 2 pink strings. The next pink will only double knot onto 1 pink string. You will now see 5 strings with the green string at the very far right. The middle string, as in the third one from the right or the third one from the left, will be pink. 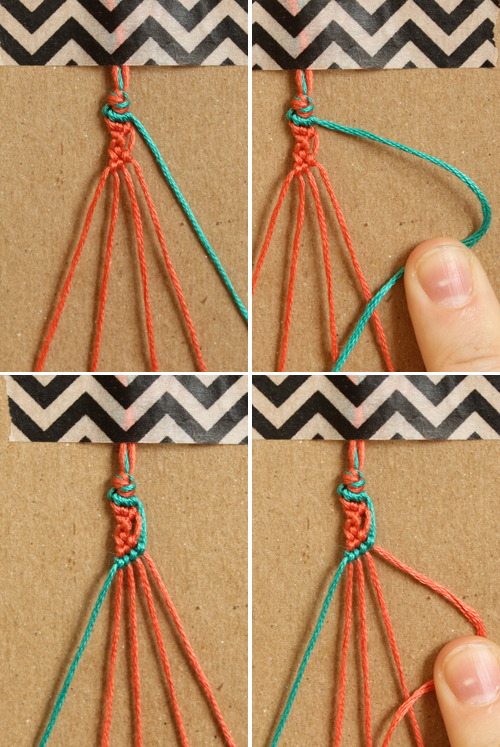 Take this string and from right to left, double not onto the 2 pink strings to the left of it. Then take the pink second from the right, the one right next to the green and double knot the 3 pink strings to the left of it. Now take the green string and double knot onto the 4 pink strings to the left of it. This pattern alternates from starting left to right then back to right to left.